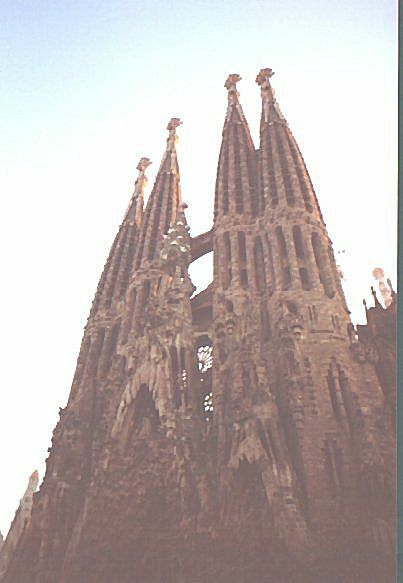 We arrived in Barcelona in the evening of Sept 30 (later than we thought we would, as the train was SLOW). A vulture offered us a room for 1500 pesetas per night per person. By far the cheapest room rate on the trip so far (and in the end, it was the cheapest room rate), we accepted. What we got was a large room with a high ceiling and a balcony. The washrooms were shared; they had a "sit down" shower and a bidet. Room rating: VERY GOOD ..... it would have got an excellent rating if it was a stand up shower; it was good value for the money. Walked up and down La Rambla, the main pedestrian boulevard. Lots of street vendors, portrait artists, and newsstands. The weather was very nice; sunny and warm! Visited the Museu Picasso. Here one can see how Pablo Picasso's art style changed as the years passed. Saw the Monument A Colom (the Columbus Monument), a monument dedicated to Christopher Columbus' epic journey across the Atlantic to "discover" America. There is an observation deck at the top of the monument. View a panoramic of Barcelona from there! Saw the Temple de la Sagrada Familia, a church with interstingly unique architecture. Unlike the previous cities we'd visited, it seemed that not very many people spoke english. Many shops observe the siesta, that is, the stores shut down between 2 PM and 5 PM for their "afternoon nap". It's kind of eery walking down the streets of Barcelona at 3 PM with all the stores closed (where is everybody?). We were going to catch an overnight train to Paris. To do this, we first had to take an evening (Oct 2) train from Barcelona to the French border town of Cerbère. Like the train we took to Barcelona, this one was slow, bumpy, and uncomfortable. Once we finally got to Cerbère, we transfered onto a French overnight train (destination Lyon, France). And wow, that train was nice (especially compared to the Spanish trains). 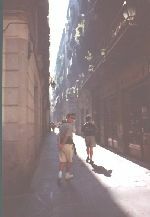 For more info on Barcelona, visit MSN's Barcelona Web Page. Taking a walk down a street in Barcelona. The Temple De La Sagrada Familia, an architecturally interesting church. 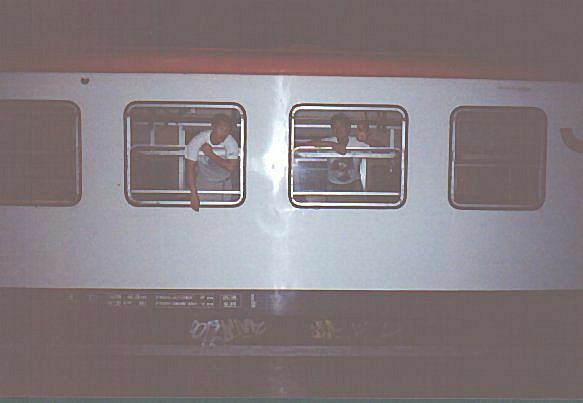 Aboard the train in Barcelona, we were about to leave for our next stop (Paris). 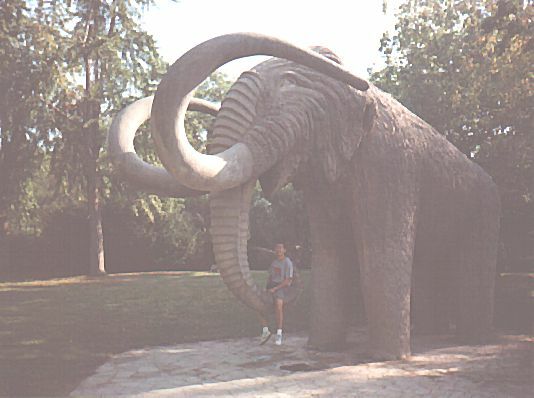 This hungry elephant (Mamuth) is found in Barcelona's Parc De La Ciutadella. It was just about to eat the peanut we fed it (see picture).